Fujian has a year-round warm and humid climate. Annual average rainfall ranges from a low of 1400 mm to a high of 2000 mm, and annual average temperature from a low of 17C to a high of 21C. It is hospitable in all seasons for travelers in this province. 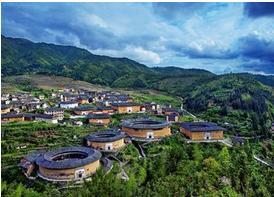 Earth Towers of the Hakkas in Yongding area are the much fabled mountain residences in this world of make believe. The industrious and facile Hui'an women in the south of Fujian add much to their folk customs. The Kaiyuan Temple looks splendid, glittering and grand despite its age. Fujian also is a place where famous national heroes like Lin Zexu and Zheng Chenggong lived and won their seats of honor in history books.